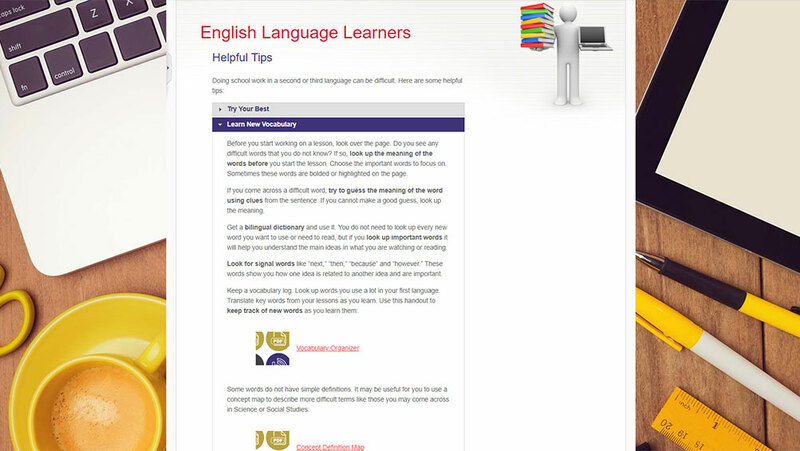 As the linguistic diversity of Ontario's student population continues to increase, some students at Virtual High School require support in learning the English language and developing a full range of English literacy skills that will enable them to achieve the curriculum expectations in all subjects and at all grade levels. The programs of study offered by Virtual High School must be flexible in order to accommodate the needs of students who require instruction in English as a second language or English literacy development. Teachers of all subjects are responsible for helping students develop their abilities to use English. Students who enrol at Virtual High School have the opportunity during registration to provide information about their English language learning backgrounds, including the number of years they have been learning English. This information informs the instruction of teachers and the accommodations they provide throughout VHS courses. English language learners (ELLs) at VHS are encouraged to explore opportunities to work in their first language, to use a bilingual dictionary, to keep a vocabulary log, and to use graphic organizers to help them complete complex tasks. ELL students are encouraged to contact their guidance coordinator if they require assessment accommodations in their courses. Students can be provided with extra time on quizzes, tests, and examinations to ensure that they have time to process the demands of the task and comprehend the language in which the assessments are written. Teachers give special consideration to more recent evidence of achievement when determining final grades in courses. Our teachers are acutely aware that it can take up to seven years for an ELL student to reach a level of proficiency in reading, writing, and abstract thinking akin to that of a speaker of a first language. VHS teachers work in conjunction with department heads and the Guidance Department to accommodate the needs of ELLs at Virtual High School.